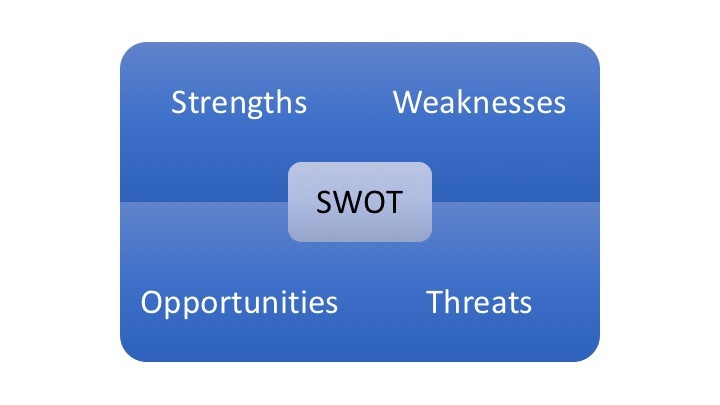 SWOT (strengths, weaknesses, opportunities and threats) analysis can be used in assessment and planning in any situation where there is a desired outcome or objective. Through the process you review your current strengths, weaknesses, opportunities and threats in respect to achieving the desired objectives. It can be used to review organisations, businesses, people, projects and situations and can assist with decision making in a wide variety of circumstances. It is a strategic planning tool, using the process opportunities can be considered, important issues identified, priorities set and action plans developed. It can also be used as a communication tool. The origins of the approach is not documented amongst peer reviewed literature. What is accepted is that it was reworked by the Harvard Business School in the 1950s and 1960s to the tool that is widely used today, (Panagiotou, 2003). Threats – external factors that are not controllable and pose risk to achieving objectives. Alone or in a group, the matrix is used to brainstorm each of the four categories. A key is to focus on the main points that clearly have evidence against them, without letting thinking become to constrained. Typically, you end up with 10 to 15 key points in each quadrant. 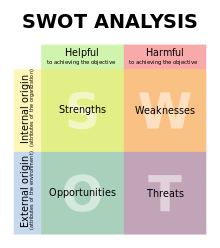 This YouTube video gives a good overview on using SWOT analysis: How to Perform a SWOT analysis. As you ask questions of your situation – E.g. What are the current strengths? What are the weaknesses? Can your weaknesses be turned into opportunities? Do your strengths offset your threats? the tool becomes personalised to anyone particular situation and can be used as a quick situation analysis or to do analysis in greater detail. YouTube Video: How to Perform a SWOT Analysis. Published by Virtual Strategist, Oct 19th 2016.